Rajasekhar Ch., Nagendranayak I. M., Kokila B. N., Rao U. K. and Vijayaraghavan S.
Orji E. A., Mgbenka B. O., Egba S. I and Obike C. A. Preliminary phytochemical and antimicrobial activities of different solvent leaf extracts of Oxystelma esculentum R.Br. Ugbabe G. E., Odeh M. O., Ibrahim J. A. and Egharevba H. O. Sodium iodide as a novel, chemoselective and highly efficient catalyst for Ntert- butoxy Carbonylation of amines at room temperature. 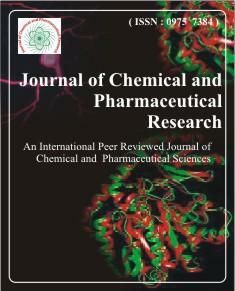 Srinivasulu K., Balasubramani K. and Manisha Vidyavathy S.
Alalan L., AL-Shammaa I. and Al-nouri A. S.
Silva-Júnior E. F.1,2, Silva D. L.1, Santos-Júnior P. F. S.1, Nascimento I. J. S.1, Silva S. W. D.3, Balliano T. L.3, Aquino T. M.1,2 and Araújo-Júnior J. X.
Pharmacognostic evaluation of Drymoglossum heterophyllum-(L)C. Chr. Sreesha N. Nair, Bindu K. and Bindu A. R.
Tugbobo O. S., Akinyede K. A. and Awonegan A. P.